This is the final part of a three part series of my round-trip, one-week road trip from Seattle, up the Canadian Rockies, over to Hyder, Alaska and back down British Columbia. Many of the photos in these blog posts are cell phone images unless otherwise noted as a fine art print. *Note: Many of the images below are cell-phone shots and certainly not of the same quality as you will find in my fine art photography galleries. After having left Hyder, Alaska and the Salmon Glacier in part 2, I made my way back to the Stewart-Cassair Highway. Today, I would be turning off of the main highway at Cranberry Junction to take it on over to the Nisga’a valley. I filled up with gas at the Meziadin Junction again, and within minutes of being back on the highway, bear number 9 for the trip. However, this bear was a grizzly! My first and only grizzly bear for the trip! After an hour and a half or so, I found the turn for Cranberry Junction and the Nisga’a Highway which would take me to New Aiyansh. What I didn’t realize is that the part of this road that takes you to New Aiyansh was not your typical highway. It was 50-some kilometers of pothole-filled gravel road. I was never worried about getting stuck, as it wasn’t wet, but the potholes were pretty difficult to deal with. I took it fairly slow, but I found the next thing out about this road. It was crawling with bears! Within the time it took to drive the 50 or so kilometers to New Aiyansh, I saw another 9 black bears, including a number of mothers with cubs. Here in Kansas we have deer everywhere. Apparently up there, bears are as common as deer! Along the Nass Valley road was a beautiful camping spot at Dragon Lake that I made note of in case I ever made it back up this way. There was a group of guys camped out, fishing and a few of them were in canoes or kayaks out on the lake. Eventually, I came out around New Aiyansh and the Nisga’a Valley Provincial Park. The scenery went from forested service road to a paved road that traveled through miles and miles of volcanic boulders. This area is home to the Tseax River Cone or the Aiyansh Volcano. The volcano was very active in the late 1600s and early 1700s, taking the lives of many First Nations people. I really wanted to actually get out and explore this area, especially Vetter Falls, but with it getting dark and the amount of bear activity I had seen, I left it for another trip. I continued down the road, eventually leaving the Nisga’a Valley Provincial Park area. By then, it was practically dark, and so I drove the rest of the way to Terrace, British Columbia to get a hotel and crash for the night. I couldn’t find many restaurants open and had to settle on a pastry at Tim Horton’s for my dinner. After scarfing that down, I passed out. I woke up fairly early, but not in time for a sunrise. I say that because it was always going to be rainy and overcast. My plan was to visit Prince Rupert about an hour and a half to the west, then make my way back to Terrace, then on to Smithers, then stay the night either in Prince George or a little further south. It was already Friday and my flight left Sunday mid-day. The drive to Prince Rupert was absolutely gorgeous! This are of British Columbia is just full of beauty. Waterfalls pouring off the mountains right on the side of the road everywhere. The highway follows the Skeena River all the way to Prince Rupert. If I had a four-wheel drive and some companions, I probably would have attempted to find some waterfalls down some logging roads that I had read about. But as it stood, I was solo and in a sedan. I stopped a number of times to get drone footage and shoot some images. None of the images are anything to write home about, but it was still beautiful none-the-less. Near Prince Rupert was a little park called Diana Provincial Park where I had read there was a waterfall. I drove up to the lake and had a little walk around it, then drove down to where the waterfall was. It was just 50 feet or so into the trees. Being in grizzly country by myself, even that far away from the car makes me uneasy, so I took a quick shot and got back to head to Prince Rupert. I was pretty hungry, and thought what better place to have fish and chips than a coastal town! I found a place that had good ratings called Dolly’s Fish Market. I also love clam chowder, and they had that too. Hey, I’m on an adventure right? So I decided to just get both! I drove around for a bit, stopping at Galloway Rapids Bridge area for a few minutes, but also knew I had a long, long drive ahead of me. So I pressed on. After finishing up my lunch (the fish and chips were very good, but the clam chowder was just ok), I started back towards Terrace. From Prince Rupert to Prince George is a little over eight hours. It was already around 11 in the morning. My big choice was whether or not to drive down to Kitimat, which was about an hour and a half detour. I figured I might as well. Who knows how long it might be before I ever made it back up to this part of the world. So I turned off the trans-Canada highway at Terrace to head south to Terrace. The drive down was fairly uneventful, but I had heard of a waterfall on the other side of Kitimat called Moore Creek Falls. I drove through Kitimat and found the falls. They were across the road from a large processing plant of some kind. There was a lot of truck traffic, and when I pulled off the road to shoot the waterfalls, a guy literally yelled out his window as he drove by “Watch out for bears!”. Now, honestly, I was probably overly cautious this trip. I didn’t stray more than a few dozen feet from the car at any given point unless I was at a major tourist destination (mostly in the Canadian Rockies). But the waterfall was literally right there, so I shot a few angles of the falls and got back in the car to leave, seeing no bears around. However, on my drive back to Terrace, I saw my 23rd bear! This bear was absolutely my favorite! I saw it off in the brush of the road about 5-10 miles outside of Kitimat, and pulled over into the pullout spot that was conveniently there to take some photos. 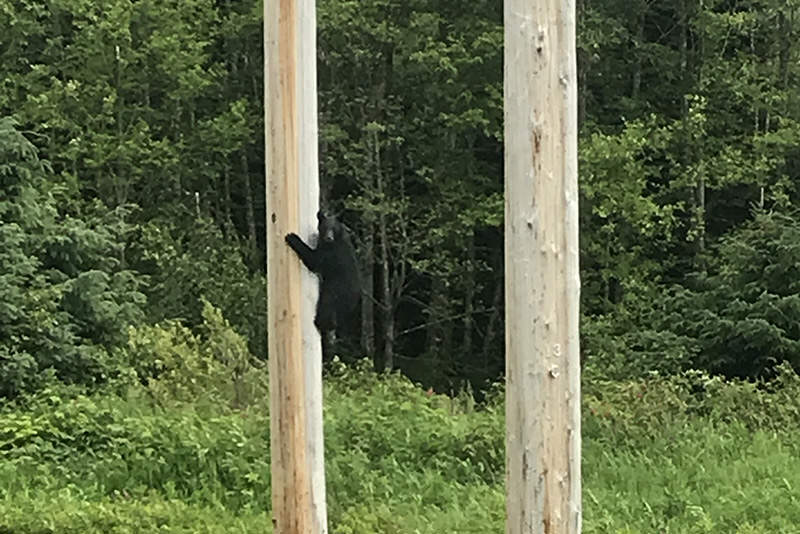 This guy (or girl, not sure) was scared to death apparently, because when it saw me pull over, it bolted up a telephone pole to get a better look. Any time I moved the car, it climbed another few feet. Not wanting to bother it anymore, I set off down the road to Terrace. Past Terrace, I was back on the main highway heading east. Somewhere between Terrace and Kitwanga, I saw bear #24 for the trip. 24 bears in 48 hours made for an awesome trip when it came to wildlife sighting! My drive back to Prince George was fairly uneventful. No more bears popped out and I assumed that #24 would be the last. By the time I reached Smithers it was already 4 p.m. and felt like the day was almost over. I picked up a pizza at Boston Pizza and worked it over on the four hour drive back to Prince George. I had hoped to get a room at Hixon, BC, about 45 minutes south of Prince George, but the few motels were all booked. There is a waterfall called Hixon Falls that didn’t look far off the highway that I figured I would visit in the morning. But because Hixon was booked up, I found a hotel in Prince George and quickly fell asleep around midnight. I woke up in time to watch one of the round of 16 World Cup games. Once I had eaten my breakfast and finished the game, I set off south where I would be flying home the next day from Seattle. I still planned to stop at Hixon Falls, and if time allowed, I wanted to take the longer route through Lillooet, Pemberton and Whistler to Vancouver and back into the states rather than the quicker straight shoot, avoiding most of the coastal range mountains. Anyways, I plugged Hixon Falls into Google Maps and set off towards Hixon. What transpired afterwards will have me never trusting Google Maps again in my life. When I got to the turn for Hixon Falls, just north of Hixon, I turned left onto the gravel road. So far so good, I thought. Though Google Maps said it was like 30km away. I thought I had remembered reading only that it was not too far off the road? Oh well, I’m already heading that way, so let’s just do this! After a few kilometers, the road had a split. One way went left, the other went right. The path to the left was nicer, but the path to the right didn’t look too bad. Google Maps said to go right. So right I went! I went a few kilometers, noting how the road wasn’t in the best shape. I kept thinking if came up on another car, it was going to be difficult to turn around. There was only really room for one car. But I kept on. Google now said 20 km. By around 12 km left, I out at a pretty lake and then the road ended at another road. Google Maps said to turn left. This road was way better than what I had been on for the past 10 km or so. So I thought maybe the route I went was just the route you go in from the north side of town and there was a better road coming in from the south side of town that I was now on. When I got to maybe 6 km left, I hit a point where Google Maps was telling me to turn left onto another road. And this road wasn’t as good. But I was only 6-7 km of the 30 or so to go. Might as well stick it out! And honestly, these roads were no worse than what I drive out in the Flint Hills sometimes. So I pressed on. As I went on, the road was showing more and more signs of lack of use. There was a clearing at one point with some Caterpillar’s and other machinery that looked like it had been in use recently. Past that spot, a little grass started appearing in the center of the gravel. It became taller and taller as I went on. But I was down to maybe a kilometer left. Might as well see this waterfall I’ve come so far for, right? Google Maps was now down to meters. 900, 800, 700, where in the world was this waterfall? Then around 500 meters the road crested and went downhill and I hit my brakes as quickly as I could. A mud pit! I stopped before going down into it, but the road had turned a bit muddy before I could stop. Obviously Google Maps was terrible wrong! I got out to look and see if I was stuck. I didn’t want to just hit the gas to try and reverse for fear of possibly getting stuck in further. I also had lost any cell signal in this spot, though I had one bar a km or so back. Still, this was bad. I tried putting it in reverse and wasn’t really moving. I couldn’t go forward as I would end up in the mud pit if I did. So I attempted to get the car turned around. After about 15 minutes of shimmying the car back and forth slowly, I managed to get it turned mostly around, but was struggling to move forward. I was in full freak-out mode by this point. I didn’t fancy a walk back to cell service knowing I was still in bear country. I may not have been in the mountains anymore, but this is heavily forested and hilly land, which is almost worse, as you can’t see above anything. I tried one more approach. I dug some flat rocks into the ground below the tires. What I noticed was that even though the road was slick, there was rock not far underneath the wet and slick dirt. So I likely wouldn’t end up digging into the dirt too much. It was the fact that I had gone down the hill a ways that made getting momentum without spinning out so difficult. So I got back in and slowly hit the gas. I didn’t seem to be moving much and was sliding a bit. At this point, I was on my last option. So I just gunned in, hoping to catch something solid rock and propel myself back up the hill to freedom. After spinning for a second, it somehow caught and the car broke free, escaping the mud! I was out! 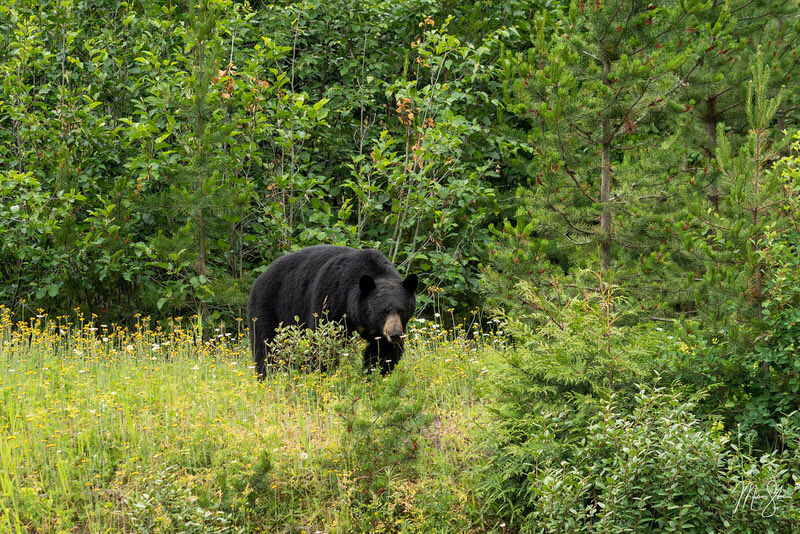 Maybe a kilometer up the road, I was in the process of thanking God Almighty Himself as I was getting out of there when the largest black bear of the entire trip ran right in front of me and into the trees. If I had walked back far enough, it’s quite possible I might have met this big fella on foot. Eventually I made it off that road back to the better and wider gravel road that looked like it was used far more often. I stayed on that, rather than taking the same way back, and this road eventually came back out on the highway, south of Hixon. It took at least 30 minutes for my nerves to calm down. Moral of the story: If you’re ever looking to visit Hixon Falls, DO NOT TRUST GOOGLE MAPS. They will lead you completely in the wrong direction! When I was at my hotel that night back in Washington, I did look up to see what happened. You can see from the map I’ve supplied below where things went wrong. For some reason, Google didn’t recognize the first road where I turned right instead of left, like I was apparently supposed to. And because the terrible little road I ended up on was the closest to Hixon Falls on the map, it just decided to lead me as close as possible, regardless of what the roads were actually like. If you want to call it a bright side, I did see bear #25 for the trip (which was the final bear of the trip). After leaving the Hixon area, I continued to head south. I had also read about a waterfall near 100 Mile House a ways south. So I thought I’d try that one since Hixon Falls failed spectacularly. But only if the road was VERY easy and if it was just off of the highway. Before making it to 100 Mile House though, I went through some areas that reminded me of marshland a bit. Looking down into the shallow water I saw a moose. This was the only moose of the trip, but still, nice addition to the 25 bears! I was also pretty hungry, so I grabbed some, you guessed it, Tim Horton’s for lunch at Quesnel. By the time I reached 100 Mile House, a nice stop was needed, so I found the parking lot for the waterfall and realized this should be a really easy one. I walked up the creek a ways to find Bridge Creek Falls. After attempting a few angles, I realized the light was just too harsh to get anything, so I went back to the car to continue my journey back home. Leaving 100 Mile House, I was only an hour or so before I would be turning towards Lillooet and the coastal mountains. From this point on, I was driving somewhat familiar territory. Back in 2012, I came this way from Banff on my way back to the states and remembered the drive to be really beautiful. And again, it was! I stopped a number of times through the coastal mountains, including the rugged Fraser River area and Seton and Duffey Lakes. I didn’t want to take too much time, however, as I wanted to make it down towards Vancouver to photograph Brandywine Falls and Shannon Falls before dark. I realized by the time I got to Whistler that I was quickly running out of daylight and was likely going to be stuck picking one or the other. As Brandywine Falls was the first of the two on my way, I went that route, following the other tourists down the path, across the railroad tracks to the beautiful vantage point that oversees the waterfall. After the waterfalls, daylight was nearly at an end. I tried to stop for a few more photos at various places only to find my memory cards completely exhausted of space, and honestly, the light was gone. So I made my way back through Vancouver and across the border before grabbed a hotel at Bellingham, Washington. The next morning I was up early to get back down to SeaTac airport for my flight home. This adventure was all I could have hoped for. I spent six years trying to make this trip happen to see the Salmon Glacier in person and it has only made me want to finish the drive all the way to Alaska proper someday. Thinking back to many of the remote areas in northern British Columbia has me remembering the amount of trees that probably turn beautiful in the fall with that first dusting of winter snow on the mountains behind them. I’m already thinking about the next possibilities to shoot in the future! With that, I hope you’ve enjoyed my three-part adventure into Canada and Alaska!